A fully equipped spacious and comfortable three bedroom family, or group, home ideal for a large family looking for a home away from home.. There is ample space inside the house and outside in the luscious green garden for children to play and explore nature. It is a three minutes' walk to the closest beach and has a fantastic view of the sunset over the sea and nearby island of Silhouette. The villa can accommodate up to 6 people. Cots for babies can be added upon demand. 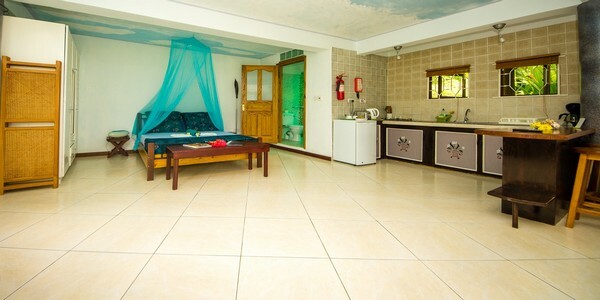 Lemongrass Villa can be rented exclusively for a family or group or clients may book the standard double rooms individually with shared kitchen. 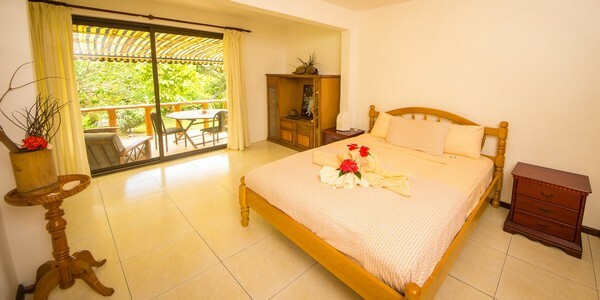 The first floor of the villa offers one superior double room with ensuite bathroom, terrace overlooking the Beau-Vallon Bay and Silhouette Island. The ground floor comprises of two standard double rooms with ensuite bathrooms and terrace overlooking the garden. A charming and inviting one bedroom apartment, boasting a large attic bedroom with a view of the entire Beau-Vallon Bay. The open plan kitchen and living space opens onto a cozy terrace overlooking the tropical garden of local fruits and flowers as well as a view of the mountains and the panoramic Beau-Vallon Beach. Palmier can also accommodate a couple with up to 2 children, fees apply for extra beds/persons. This delightful fully self contained open plan studio apartment designed and furnished with an artistic flair would delight any traveler looking for the perfect place to relax in paradise. 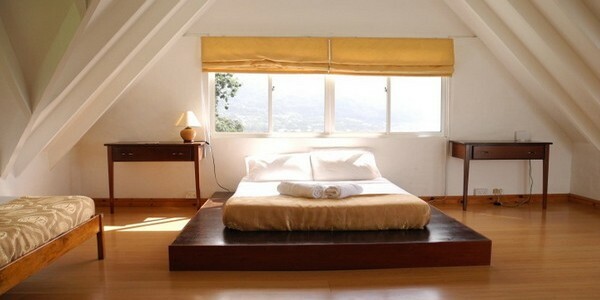 Perfect for a couple, however the apartment can also accomodate 1 extra adult or a family of 2 adults and 2 children. Fees apply for extra beds/persons. 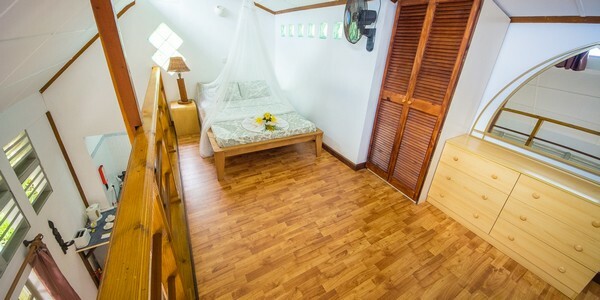 A mezzanine studio with its own well equipped kitchen and spacious bathroom, large enough to accommodate any young couple looking for a holiday of adventure to explore the diving, boating, fishing and hiking scenes of Mahe. This apartment does not have aircon, but has fans. It is made of wood and is well ventilated. The Jacarnada Cottage and apartments are ecologically friendly, completely built from wood and a new addition to the Lodge. Each accommodating maximum 3 persons, they blend in perfectly in the natural enviroment and are fitted with solar for energy and modern facilities such as aircon.